This class aims to build a solid foundation for an understanding of the fundamentals of meteorology. Skillsets that will be developed include: gaining an appreciation and understanding of severe summer and winter weather, interpreting human impacts on global climate, becoming a more critical and educated consumer of weather information, and gaining the tools and knowledge necessary to engage in lifelong learning. This book is on reserve at the Earth and Mineral Sciences Library in Deike Building. Lecture slides will be posted on ANGEL. Homework assignments will typically be posted on ANGEL. Answer keys will be posted after grading is complete. Midterm answer keys will be posted after midterm grading is complete. Additional links and recommended websites may be mentioned in class and posted on ANGEL under "Resources". Homework: Homework will be assigned approximately weekly. Some weeks, part of a Wednesday lecture will be devoted to an introduction of the new assignment and a guided in-class work session. Homework assignments must be submitted in-person at the beginning of class on Wednesdays (1:25 PM) in order to receive credit, except in cases in which my permission was obtained beforehand. Note that your lowest 2 homework assignment scores will be dropped, so you will have some breathing room. Quizzes: Short quizzes will be given in-class approximately weekly and will always be announced at least a class lecture in advance. Make-up quizzes may be scheduled at my convenience for excused absences. I will count your highest ~10 quiz grades. Midterms: Two midterm exams will be administered on Friday, February 17 and Wednesday, March 29 at the Pollock Testing Center (approximately a week prior to each exam, you will be given instructions on how to self-schedule your exams). Make-up exams may be scheduled at my convenience for excused absences that you notify me about in advance. The make-up exam should be taken before the scheduled exam time, if at all possible. Please contact me ASAP if you know you will be missing an exam. Before each midterm there will be an entire class period devoted to review, and potentially an evening review session. Midterm exams are non-cumulative –that is, Midterm #2 will only cover the material studied since Midterm #1's cutoff. Final Exam: The date and location of the final cumulative exam will be announced when it is confirmed by the university –the date will be sometime during Finals Week. There will be a review session in our final lecture to help prepare you, and I will hold extra office hours during that last week of classes. 11:55 PM on Friday, April 21, with no exceptions. All infractions will be pursued in accordance with the Earth and Mineral Sciences Academic Integrity Policy (http://www.ems.psu.edu/current_undergrad_students/academics/integrity_policy). Infractions include, but are not limited to: copying someone else's work, knowingly allowing someone else to copy your work, submitting someone else's work without proper citation, altering exams after having them handed back in an attempt to raise your grade, and submitting previously used work without permission. To learn more about how to avoid such infractions, see Penn State's Plagiarism Tutorial for Students (http://tlt.psu.edu/plagiarism/student-tutorial/). Students who commit infractions will receive at least a 0 on the assignment/exam/quiz and may very well receive an F or XF in the course. This course abides by the Penn State Attendance Policy E-11: http://undergrad.psu.edu/aappm/E-11-class-attendance.html, and Conflict Exam Policy 44-35: http://senate.psu.edu/policies-and-rules-for-undergraduate-students/44-00-examinations/#44-35 . Please also see Illness Verification Policy: http://studentaffairs.psu.edu/health/welcome/illnessVerification/, and Religious Observance Policy: http://undergrad.psu.edu/aappm/R-4-religious-observances.html. Students who miss class for legitimate reasons will be given a reasonable opportunity to make up missed work, including exams and quizzes. Students are not required to secure the signature of medical personnel in the case of illness or injury and should use their best judgment on whether they are well enough to attend class or not; the University Health Center will not provide medical verification for minor illnesses or injuries. Other legitimate reasons for missing class include religious observance, military service, family emergencies, regularly scheduled university-approved curricular or extracurricular activities, and post-graduate, career-related interviews when there is no opportunity for students to re-schedule these opportunities (such as employment and graduate school final interviews). Students who encounter serious family, health, or personal situations that result in extended absences should contact the Office of the Assistant Vice President for Student Affairs (AVPSA) and Student and Family Services for help: http://studentaffairs.psu.edu/familyservices/ . Whenever possible, students participating in University-approved activities should submit to the instructor a Class Absence Form available from the Registrar's Office: http://www.registrar.psu.edu/student_forms/, at least one week prior to the activity. In the case of an emergency, we will follow the College of Earth and Mineral Sciences Critical Incident Plan (http://www.ems.psu.edu/sites/default/files/u5/research/CIP_March2016.pdf). In the event of an evacuation, we will follow posted evacuation routes and gather at the Designated Meeting Site. 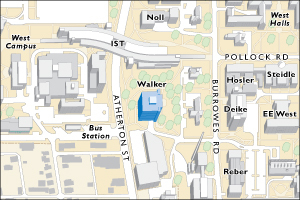 Evacuation routes for all EMS buildings are available at http://www.ems.psu.edu/faculty_staff/safety/evacuationPlans. For more information regarding actions to take during particular emergencies, please see the Penn State Emergency Action Guides. Please note that the specifics of this Course Syllabus can be changed at any time, and you will be responsible for abiding by any such changes. Changes will be posted to ANGEL, and announced in class. There will be no surprises.